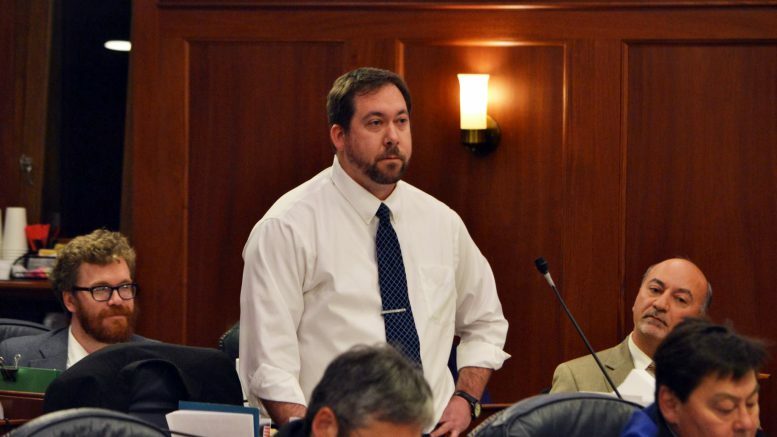 Former state Rep. Zach Fansler appeared by phone in a Juneau courtroom today to plead guilty to second-degree harassment for a January attack on a woman after a night of drinking. Nearly six months after the incident, Fansler was sentenced to a year of probation, a 10-day suspended sentence, alcohol treatment and 80 hours of community service to be completed within the next six months, according to a report by the Juneau Empire. He’s also prohibited from drinking alcohol or entering bars or liquor stores for a year as part of his probation. The guilty plea is part of the result of a settlement between Fansler and the state Office of Special Prosecutions. “We do think Mr. Fansler should have some serious length of community service so he can do something and reflect on his conduct,” prosecuting attorney Paul Miovas argued in court, according to the Empire. Fansler was also ordered to repay the victim $905.65 for expenses. Fansler resigned from office two weeks after an account of the attack was published by the Empire. The account detailed how Fansler and the woman had been drinking together before Fansler slapped the woman multiple times, rupturing an eardrum. In a text message exchange provided to the Juneau Empire, Fansler brushed off the incident as the result of a kink and tried to make amends with an offer of dinner and a movie. Though Fansler did not appear in court personally, the victim did. Miovas read a letter she wrote (a copy was also provided to The Midnight Sun) that detailed the impacts Fansler’s actions have had on her, and explained why she fought for the charges to be brought against him. The impact statement provides wrenching details about the lasting damage that night had on the victim. That moment festered into constant fear. Fansler had been characterized by some as a rising star politician in the Alaska Democratic Party–including an article that heaped praise on his role in helping turn Alaska purple–but there were long concerns and warning signs about his drinking. Fansler’s alcohol problems were raised prior to his election. KYUK resurfaced questions that one of its reporters asked after multiple people in the community raised such concerns. There, too, Fansler brushed off concerns about his behavior. Much of Fansler’s sentence also seeks to hold him accountable for his drinking. He’ll undergo an alcohol assessment and is banned from drinking or entering bars or liquor stores from a year. According to the Empire, Miovas said Fansler’s behavior may have been fueled by alcohol but it wasn’t an excuse. Fansler had been filed to run for re-election, but formally withdrew from the race recently. Be the first to comment on "Former Rep. Zach Fansler has pleaded guilty to criminal charge for attack: Report"